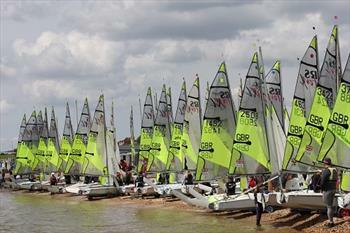 The 2013 Sekonda RS Feva UK National Championships hosted by Thorpe Bay Yacht Club took place over the Whitsun Bank Holiday. The 93 entries were split into four flights so everyone raced each other in qualifying rounds on day one. The weather forecast was cloudy with 10 knots dropping to 5 knots later. However the sun came out as the fleet launched. The fleet were excitable & eager, resulting in a general recall & a black flag flag with 11 boats eventually caught out. This first race was won by Elliott Wells & Jake Todd with Arthur Brown & Niamh Davies in 2nd, whilst 3rd was former Feva sailor Anna Prescott & zone squad crew Emma Tardrew. The 2nd flight got away & the win went to Jamie Smith & Piers Nicholls; 2nd Tom Darling & Will Dolin with Emma Baker & Izzy Black in 3rd. The 2nd start sequence got under way in 5 to 12 knots of shifty breeze coming off the land. Anna & Emma got a great pin end start & tacked onto port. But it was Hannah Bristow & Bobby Hewitt leading at the windward mark from Jamie & Piers with Harvey Martin & Will Ward in 3rd. The shifty wind lead to lots of place changing. But by the finish Jamie & Piers had regained the lead whilst Hannah & Bobby took 2nd with Elliott & Jake climbing to 3rd. The 2nd flight was lead from start to finish by Arthur & Niamh with Anna & Emma dropping from 2nd to 3rd allowing James & Henry to post a 2nd on the water but found themselves black flagged. By race 3 the spring tide was on the ebb & causing havoc. The race was abandoned as the combination of wind shift & tide resulted in boats laying the windward mark in flight one whilst boats in flight two struggled to cross the start line. Eventually the decision was made to send the flights on a windward/leeward course as the wind was dropping. The 2nd flight waited for the first flight to finish. Thankfully the first flight made it to windward mark & shot downwind with the tide. Jamie & Piers posted their 3rd bullet; 2nd Arthur & Niamh; 3rd Nick Edmonds & Rafe Watson. As the first flight finished the 2nd flight were started & thankfully the wind picked up helping the fleet against the tide. The race was won by Tom & Will after a pin end port tack start allowing them to lead from start to finish; 2nd Elliott & Jake; 3rd Katie Davies & Gemma Keers. The fleet was split into Gold & Silver for day two, with the sun out & with 12 knots, the conditions were perfect. Silver fleet got away with two boats caught black flag, they were sent around the outer loop of the trapezoid course. Gold fleet got away all clear 5 minutes later. Lots of capsizes in silver fleet as the wind increased to 15 knots. In the lead was Sam Barson & James Foster; 2nd James Driver & Alex Ellis-Thomas; 3rd Alice Kidd & Remi Pfister. However, gear failure & capsizes took their toll. At the finish silver was won by Alice & Remi; 2nd Ed Whattoff & James Rigby; 3rd Samuel & Jemima Leedham. The gold fleet saw a 'master class' on heavy wind sailing by Elliott & Jake who lead from start to finish and nearly overtook the whole silver fleet too! Flynn Davies & Henry Jameson rounded 2nd with Tom & Will 3rd, positions they held to the finish as the wind increased to 18 knots. The wind dropped a little for the 2nd start of the day. The silver fleet were sent off to a shorter outer loop so hopefully gold would be less likely to catch them up. At the windward mark Freya Black & Georgia Baker lead from Charlie Blazeby & Alex Sando-Reynolds, in 3rd Cameron & Euan Harris, who then went into turbo charge to take the win; 2nd Alice & Remi; 3rd Charlie & Alex. The gold flight saw James Hutton-Penman & Thomas Jayasekara in the lead at mark one; 2nd Jamie Jobson & Daniel Armstrong; 3rd James & Henry. However, Elliot & Jake were ready to pounce downwind & stormed ahead to take another gold win for race two; 2nd James & Thomas; 3rd James & Henry. Silver fleet away all clear for the 3rd race of the day, but after a general recall for gold fleet, there was a postponement as the line was reset, as the tide had now changed. It took 5 attempts to get gold fleet away. The fallout was 9 boats caught black flag, the pin end boat was finally replaced with a rib more able to hold its anchor. The silver race was won by Cameron & Euan; 2nd Bradley & Bella; 3rd Sam & James. The final race for silver fleet saw 1st Sam & James; 2nd Bradley & Bella; 3rd Samuel & Jemima; gold fleet, however, were still racing - race 3! 1st again – Elliott & Jake; 2nd James & Thomas; 3rd Courtney Bilbrough & Orla Mitchell. In the final race of the day Elliott & Jake made it a clean sweep with 4 race wins; 2nd James & Thomas; 3rd Tom & Will. Light easterly winds & torrential rain arrived for the final day of the championship so a very different game. After a short postponement silver fleet got away, all clear, in rain & 10 knots of breeze, which built under the rain clouds, before disappearing again. The gold fleet had two general recalls with two boats called black flag, the start was postponed while the course was reset. Meanwhile silver race 8 was won by Sam & James; 2nd Bradley & Bella. When gold eventually started it was lead by Harvey & Will at the windward mark from Elliott & Jake; 3rd Tom & Will. The shifty conditions resulted in lots of place changing but by the finish 1st was Harvey & Will; 2nd Jamie & Piers; 3rd Tom & Will. A rain squall & wind shift resulted in another delay whilst the course was reset. Two boats caught black flag whilst trying to port tack fleet on pin end. Tom & Will lead from start to finish only to discover they were black flagged even though they heard the pin end boat call 'all clear'. At the leeward gate it was Samuel Grade & Katie Prescott in pole position; followed by Emma Baker & Izzy Black. By the finish the wind had dropped to 6 knots with light rain. Emma & Izzy took top spot; 2nd Sam & Katie; 3rd Courtney & Orla. So 2013 UK RS Feva National Champions are Elliott Wells (age 12) & Jake Todd (age 15); Jamie Smith (age 13) & Piers Nicholls (age 12) are Junior Champions for 2013. 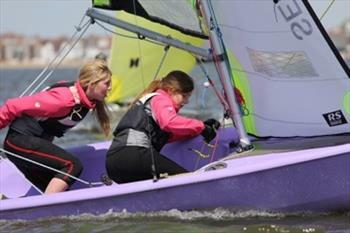 Winners of the under 13 '405 Bursary', & winning a kite in the Hobie 405 colours were Freya Black & Georgia Baker. TBYC did a great job & although the final day proved a little wet, the sailing conditions were the best ever, with a variety of wind strengths, wind directions & tidal conditions, plus three days of sunshine, was better than anyone could have expected for a British Bank Holiday. A huge thanks to the event sponsors: Sekonda, Magic Marine, Crew Clothing, Insurance4dinghies & local sponsors Cellars.